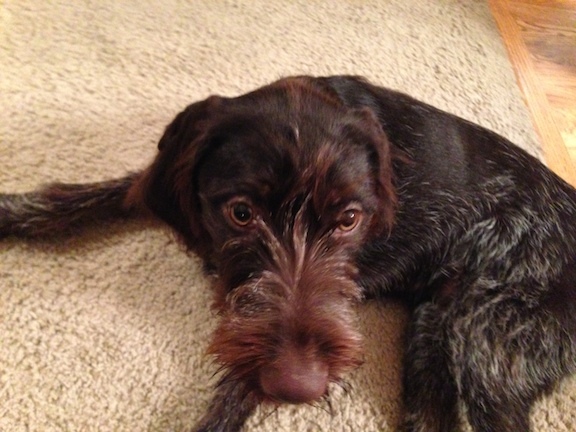 Sly is a seven-month-old German Wire Hair Pointer. His owners contacted me for help after Sly escaped a kennel, then proceeded to destroyed a chair and a few other things. When I arrived for the session, Sly met me excitedly at the door jumping up and rubbing himself on my shins. I turned to face him and offered a few verbal corrections which stopped the jumping up. His owner said he never calmed down and stopped with a guest arrived like that before. Just another example of how quickly a dog can change when it clearly understands what the human is saying. Next I demonstrated a leadership exercise to help Sly learn to self restrain. I started out in the kitchen and once I disagreed with his attempt to circumvent the exercise, he left the room. I moved to the living room for the next few repetitions and Sly got what I was asking right away. I coached his owners through the exercise and suggested they practice it with him daily for the next week or two. This will give the dog exposure to and experience at restraining himself. These skills will pay dividends for the remainder of Sly’s life. Next we brought out the wire kennel that Sly had escaped from before. His owner was ready to return the kennel due to Sly’s escape, but waited for the session so I could show them a few exercises to help the dog learn to relax inside. For many dogs, its not the kennel itself that is the issue. The issue is being put in the kennel and then having their owner’s leave them alone. For dogs, being left alone can be difficult as they are social creatures. Members of a pack do things together. Its rare for one to leave the pack to do something on its own. This is why some dogs have a difficult time when being left alone. I tossed in a few high value treats to see if Sly had any issues with the kennel itself. Because he went in without any hesitation or prodding, its likely his issue was being left alone. To test this theory I closed the door to the kennel and had his owner leave through the front door. As soon as I exited out of the dog’s sight, Sly started to cry and paw at the door to the kennel. Seeing all I needed, I had his owner come back inside and went over a few exercises to practice that will help Sly learn to stay calm inside the kennel. Its important his owners gradually increase the amount of time he is asked to stay inside it and to only practice it when they are there. The more exposure and experience Sly has of being inside the kennel in a calm manner will diminish his fear of being left alone later. Once he passes the next threshold, I advised his owner to leave the house for only 60 seconds, then return and not make a big deal out of the return. Instead to go to the kennel but not let Sly exit until he was calm and relaxed. By gradually increasing the time and only allowing the dog to exit when calm and balanced, we can help desensitize the dog from the fear of being alone. If his owners practice these techniques for the next few weeks, Sly should be able to stay inside the kennel for longer and longer periods of time until the issues are a distant memory.